The Nimbus was a Danish motorcycle produced from 1919 to 1960 by Fisker and Nielsen of Copenhagen, Denmark. Two basic models were produced, both with a 750 cc four-cylinder engine. 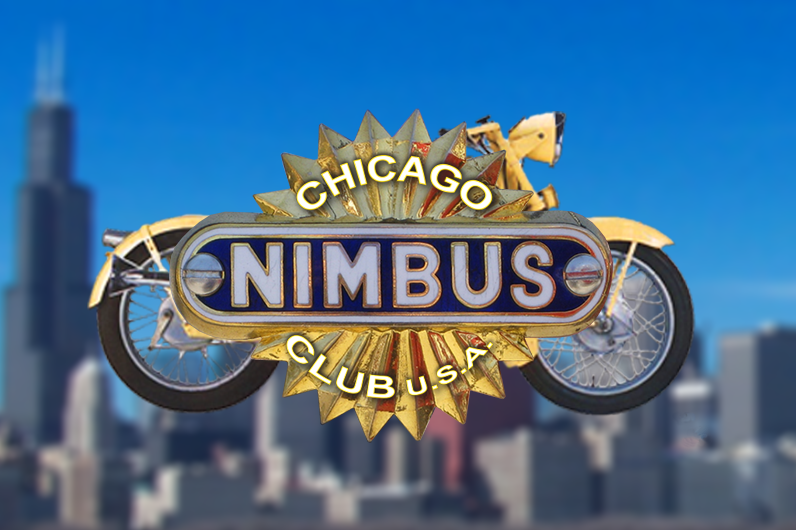 The first Nimbus motorcycle had a four-cylinder inline engine of 746 cc (45.5 cu in) capacity, which drove the rear wheel through a shaft drive rather than the chain usually used at that time, and a power output of approximately 10 hp. Its top speed was around 85 km/h (53 mph) with a sidecar fitted. It had both front and rear wheel suspension, and soon acquired the nickname of Kakkelovnsrør (“Stovepipe”) due to the thick, round pipe between the saddle and handlebars which as well as forming part of the bike’s chassis contained the petrol tank. Two more machines were constructed in 1919, but mass production did not begin until ‘Fisker & Nielsen’ became a limited liability company in 1920. Disappointed by poor sales, Fisker began entering the Stovepipe in all the races that he could, often with a sidecar attached, and built up a good reputation for the machine. However, the introduction of a sales tax on motorcycles in 1924 and an economic recession resulted in production being phased out from 1926 on after 1,300 machines had been produced. With his son Anders, Fisker started designing a new machine in 1932 and in 1934 they demonstrated a new Nimbus motorcycle, the Type C. It retained the shaft drive, a completely redesigned ohv and ohc engine of 18 (later 22) hp, and a frame made from steel strips riveted together, which were shaped to go around the gas tank much like on the pressed steel frames on several other motorcycles of the period. 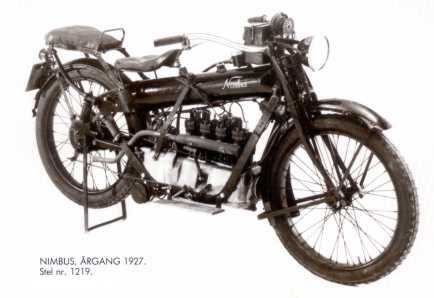 Front suspension was by telescopic fork; although this was introduced a year before the BMW R12, the R12’s fork had hydraulic damping upon introduction while the Nimbus’s fork did not have hydraulic damping until 1939. Its distinctive humming exhaust note led to it being nicknamed Humlebien (“The Bumblebee”). The first customer received his Type C in the summer of 1934, and the Bumblebee soon became the best-selling motorcycle in Denmark, sold by an efficient dealer network. The Danish Post Office, Army, and Police became customers. In 1939, as World War II loomed, the Danish government spent DKK 50 million on motorising the army – which bought many Type Cs. During the occupation by German forces from 1940 to 1945 it was difficult for Fisker & Nielsen to obtain the materials needed for motorcycle production and only about 600 machines were made during the period. Right after World War II a much improved ohv engine was built and tested. Seeing, however, that the factory had no trouble selling every motorcycle built, it was decided not to make any major investments in new tooling. Instead more minor improvements were made to the existing models, usually making it possible to upgrade older models. The Danish Army bought around 20% of Fisker & Nielsen’s total production, while the Danish Postal Service also bought many, using them as late as 1972. The Danish police was also a large customer, but phased out their Nimbuses much earlier in the late 1950s and early 1960s, when it became too slow to keep up with modern cars and motorcycles; the top speed of a stock solo bike was only 120 km/h (75 mph), and that for brief bursts only. Few were exported. In the 1950s some further prototypes were built, like a four-cylinder with a rotary valve and carbon seals as well as a two-cylinder model with rear suspension, neither of which reached production. Several prototypes with rear suspension and an Earles front fork were also built. Innumerable details of “The Bumblebee” were changed during its lifespan, the few major ones being a switch from hand to foot gear change, larger brakes and an improved front fork. Production ceased in 1960, when the last contract from the Danish Army was delivered. Prototypen der prøvekøres og tilblivelse af den første Nimbus kakkelovnsrøret. The prototype is tested and genesis of the first Nimbus stove pipe.